You paid for details but are you really receiving what you paid for? Are you receiving what you need to ensure proper install? Can you properly order material? Is this lack of information costing you money and sacrificing safety? We take a look at an identical install. One set of drawings provided by MP Drafting and the other provided by a competitor. Text is scaled so that it is clearly legible on 11×17 paper. Smaller, more manageable sets can be useful. Alternate units are given for easy reference to the architectural plans no matter how the architect presents the dimensions. Complete dimension build ups from rough opening to rough opening are always present and match details. Floor lines are given for easy reference. 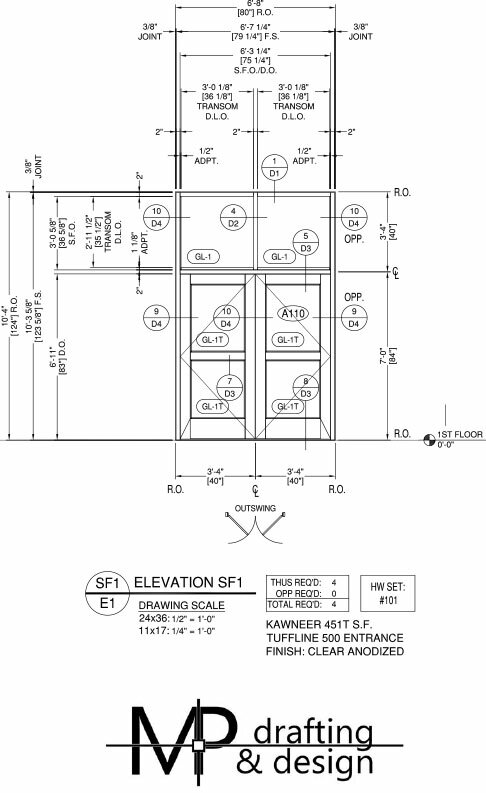 Elevation tags and glass tags match architectural plans whenever possible. 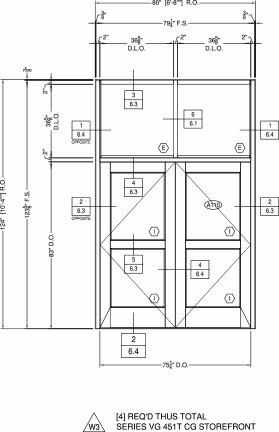 Door swings and hardware schedules are listed at all elevations with entrances. System type, entrance type, and finish is shown at all elevations. Alternate units are not given at all dimensions. Not all dimensions are labeled as to what they are (joint at this instance). Stacked dimensions can be difficult to read. Transom adaptor dimensions are not given. The true transom D.L.O. is not represented. Text size is set up for 24×36 paper making it hard to read on smaller, more easily managed sets. No centerline dimensions given for coordination. Non-intuitive sheet description. 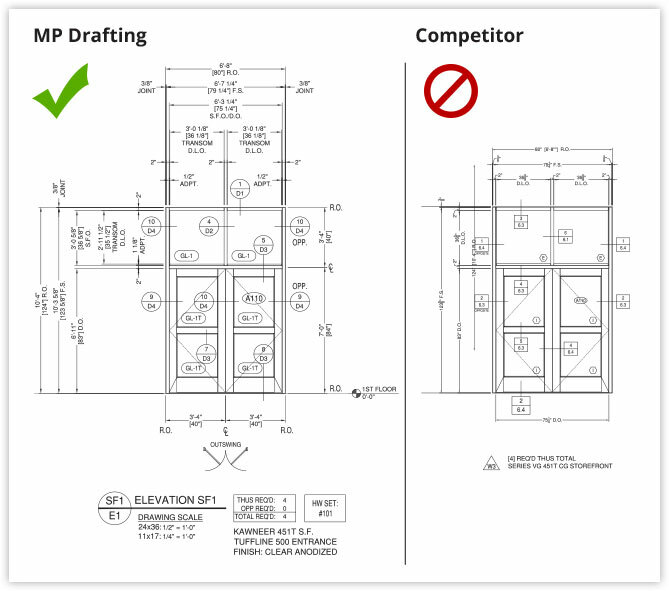 MP Drafting uses P (plan views), S (sections), E (elevations), and D (details) for quick reference. No door swing or hardware schedule number listed.